BCDB Rating: "Cannonball Run II" has not yet received enough votes to be rated. This page has been viewed 14 times this month, and 1551 times total. Golden Harvest Company, Warner Bros. Pictures, Arcafin B.V. Cartoon Characters: J.J. McClure, Victor Prinzim, Captain Chaos, Don Canneloni, Jamie Blake, Morris Fenderbaum, The Sheik, Betty, Hymie Kaplan, Veronica, Lamborghini Babes, Fisherman, Fisherman, Mitsubishi Engineer, Terry, Doctor Nikolas Van Helsing, Sonny, Mitsubishi Driver, King, Pvt. Homer Lyle, Fisherman, Mrs. Goldfarb, Don Don Canneloni, Tony, Slim, Mack, Mel, Caesar, Sergeant in CHP Car, Japanese Businessman, Beautiful Girl, Young CHP Officer, Uncle Cal, The Slapper, Jilly, Sheriff, Bobby Berosini's Orangutan, Blake's Girl in Bed, Co-Pilot, Talkative Noisy Spectator, Sheik's Girl, Official, Nicky, Tire Store Employee, Policeman at Lake, Announcer, Bartender, Japanese Executive, Sheldon, Guy on Bike, Waitress, Driver Stopped for Girls, Porsche 928 Driver, Nun, Biker, Frank Sinatra, Beth Glenn, Gas Station Attendants, Pilots, CHP Officers. Produced By Albert S. Ruddy, Raymond Chow, Andre Morgan. Written By Hal Needham, Albert S. Ruddy, Harvey Miller. Editor: William Gordean, Carl Kress. Originally Released on June 29, 1984. Do you have anything to add to this page? 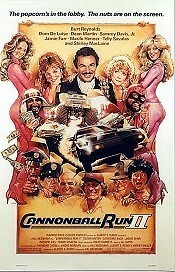 Have we made any mistakes... or do you have any additional information about Cannonball Run II? If so, we would love to hear from you. Please send us a quick note with your additions or corrections to this page, and we will make the corrections as soon as possible! 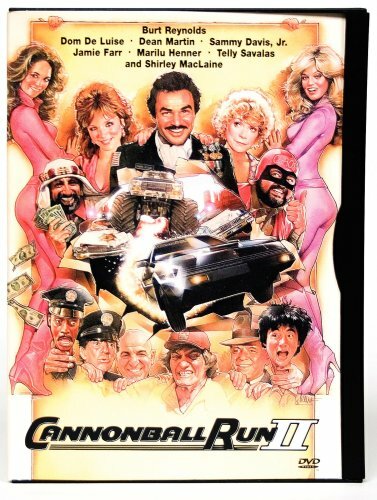 Do you love Cannonball Run II, or do you think it is the worst cartoon ever? Let us know what you think! Surely you have an opinion... so share what you think. Take a minute and post your own comments about this cartoon here. Cannonball Run II by Big Cartoon DataBase is licensed under a Creative Commons Attribution-NonCommercial-ShareAlike 4.0 International License.